Amoda Maa offers an intimate conversation that includes the totality of the human experience within the unbounded space of unconditioned awareness. The conversation is always spontaneous, allowing jewels of wisdom to arise naturally in support of the journey of awakening and the deepening into living an awakened life. The meeting starts with Silent Sitting, followed by Discourse and time for Questions & Answers. Please bring your innermost questions, or simply rest in silent presence. Amoda will be joined by her husband and beloved, Kavi, who will offer improvised music of the heart. Kavi’s awakening has flowered gracefully through his relationship with Amoda over the past 15 years. Suggested donation at the door - $20 (cash or check only). No-one will be turned away due to lack of funds (if you are in financial difficulty, please contribute to the best of your ability). This meeting is held at the beautiful Wisdom's Goldenrod Center of Philosophic Studies, a place of rich spiritual heritage, located in the town of Hector on the shores of Seneca Lake, a 30-40 minute drive from Ithaca. A non-residential weekend. You can attend one or both days. This Weekend Intensive is an opportunity to join Amoda Maa in an intimate conversation that includes the totality of the human experience within the unbounded space of unconditioned awareness. She asks you to investigate with radical honesty what prevents you from knowing your true nature as openness, and then invites you to live from this openness in the midst of the challenges and turbulence of everyday interactions. The conversation is always spontaneous, allowing jewels of wisdom to arise naturally in support of the journey of awakening and the deepening into living an awakened life. Each day includes time for Silent Sitting, Discourse, and Inquiry (Q&A) Sessions. Please bring your innermost questions, or simply rest in silent presence. Amoda will be joined by her husband and beloved, Kavi, who will offer improvised music of the heart as well as engaging in the conversation with his wisdom and love. His awakening has flowered gracefully through his relationship with Amoda over the past 15 years. Please note - this is a non-residential event held over 2 days. You are encouraged to attend both days, as we will create a safe container within which we can dive into a deeper inquiry. This container also amplifies the frequency field of love to facilitate transformation. If you choose to register for just the Saturday and you then wish to also attend the Sunday, you can make a last minute reservation at the door (cash or check only) if there are places still available. Seating is provided, but please feel free to bring your own cushion for extra comfort. Please bring your own lunch. We will provide snacks & refreshments. The event is held at the beautifully elegant Treman Center in Newfield, just 10 minutes drive from downtown Ithaca. Cancellation Policy - If a cancellation is made up to 14 days prior the event (before April 13), a refund will be made minus an administration fee of $25 for a one day ticket and $50 for a two-day ticket. There are no refunds possible if a cancellation is made on or after April 13 (except in exceptional circumstances). This afternoon Public Meeting is an opportunity to join Amoda Maa in an intimate conversation that includes the totality of the human experience within the unbounded space of unconditioned awareness. The conversation is always spontaneous, allowing jewels of wisdom to arise naturally in support of the journey of awakening and the deepening into living an awakened life. The meeting includes time for Silent Sitting, Discourse, and Inquiry (Q&A) Sessions. Please bring your innermost questions, or simply rest in silent presence. Both newcomers and those familiar with Amoda's message are welcome - although it is recommended that you read her book "Embodied Enlightenment" prior to attending this event or watch her videos. Cost - $35 full rate / $30 reduced rate. Please reserve your place in advance, if you can. You may also show up and pay at the door - but please make sure you arrive about 5-10 minutes before the start so we can register you. Please note - we cannot make refunds if you purchase a ticket and do not attend. If you make a cancellation up to 3 days prior to the event, we can make a refund minus a $12 admin fee. Contact - if you have any questions about this event, please email us here. Please note - this is a non-residential event held over 2 days. You are encouraged to attend both days, as we will create a safe container within which we can dive into a deeper inquiry. This container also amplifies the frequency field of love to facilitate transformation. Although, you may also choose to attend just on one day (either Saturday or Sunday). If you choose to register for just the Saturday and you then wish to also attend the Sunday, you can make a last minute reservation at the door (cash or check only) if there are places still available. The event is held at the Become One Wholeness Yoga Studio in Lyndhurst, New Jersey. It is easily accessible from New York City (by bus, train or drive) - the closest station is Kingsland (just a few minutes walk to the venue). Newark Airport is just 10 minutes away. Seating is provided, including chairs, bolsters and cushions. You may wish to bring your own backjack, if you prefer. Please bring your own lunch. There are also numerous cafes and restaurants very close by. Cancellation Policy - If a cancellation is made up to 14 days prior the event (before May 4), a refund will be made minus an administration fee of $25 for a one-day ticket and $50 for a two-day ticket. There are no refunds possible if a cancellation is made on or after May 4 (except in exceptional circumstances). 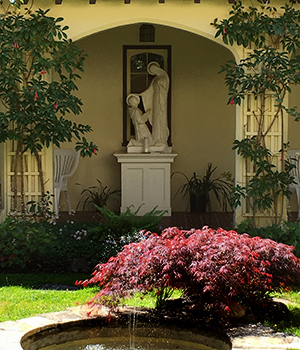 This retreat is an opportunity to turn within and allow a deeper inquiry that arises from the tenderness of the heart. The Daily Schedule will include periods of Silent Sitting, Talks, and Inquiry (Q&A) Sessions. There will also be time for contemplation, rest, and walking. The retreat is held throughout in a container of silence (no talking or interaction outside of the Inquiry Sessions, and no social conversation at meal-times or during breaks). In this silence, mind and heart are given the possibility of coming home to their deepest longing. The retreat will be supported by Kavi (Amoda's husband and beloved), who will provide sacred music to take you deeper into the inner sanctuary of the heart. We recommend that you already are familiar with Amoda’s teachings, either having attended a previous event, having read her book 'Embodied Enlightenment' or having watched her videos. Full cost (Tuition + Accommodation + Meals) for Single or Double Room is shown in the Ticket prices below. Full cost for Commuters with Meals is also shown in the Ticket prices below. If you require Commuter without Meals or with only lunch/dinner, please contact us. We can also offer a Payment Plan if you need to spread your payments over a period of time - please contact us here before reserving your place. Cancellation policy - Prior to April 10th, full refund minus $75 administration charge. After April 10th and up to May 8th, 50% refund. After May 8th, no refunds are possible. This deep dive retreat is an immersion into the path of surrender. Held in a container of unconditional acceptance, you will be supported in the process of purifying the heart. Through tender openness and unwavering honesty, you will be invited to bring to light everything that stands in the way of your true radiant nature as love … a love that transcends life and yet fully embraces it. Amoda points the way for you to dive in, face your personal wounds with courage and tender honesty, challenge your assumptions, and root the full flowering of your consciousness in the very belly of your humanity. The retreat will be supported by Kavi (Amoda's husband and beloved), who will provide improvised music of the heart, and his own unique brand of wild wisdom and unbounded love. His awakening has flowered gracefully through his relationship with Amoda over the past 15 years, and he brings to the conversation his deeply poetic nature and clarity of vision. The Daily Schedule will include Talks, Inquiry (Q&A) Sessions, Silent Sitting, Guided and Active Meditations, Sacred Music of the Heart. The sessions allow for an intimate and spontaneous conversation, effortlessly traversing the depth and breadth of heartbreak, humor, and sacredness. There will also be time for contemplation, rest, walking, and enjoying heart-centered celebration with each other. Together, we will enter the slipstream of unspeakable grace inside the human experience! Immersions are for those who are ready for real transformation, and the results are often life-changing. We recommend that you already are familiar with Amoda’s teachings, either having attended a previous event, having read her book 'Embodied Enlightenment' or having watched her videos. This is a fully residential retreat - accommodation and meals included (see details below). All attendees are required to stay overnight at the retreat center, as this creates an energetic container for the deep dive. 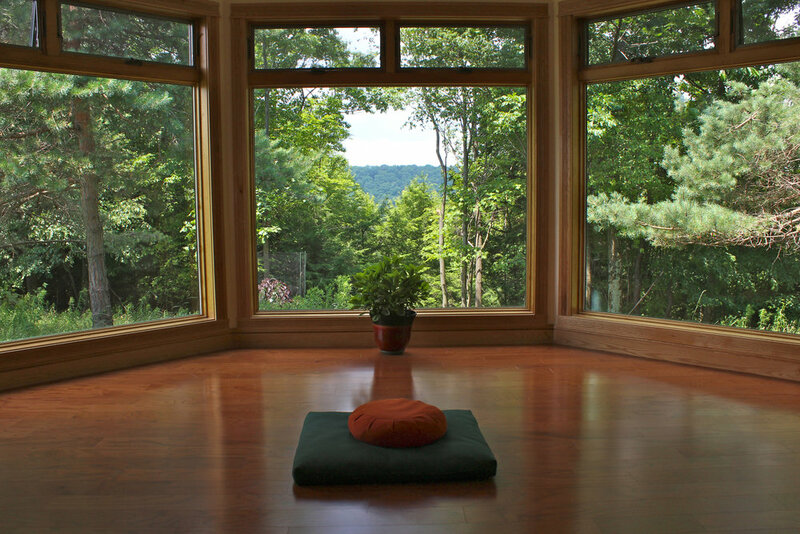 Held at Light on the Hill - a beautiful retreat center perched on a hill in Upstate New York and surrounded by 236 acres of woods, streams, walking paths and panoramic views. The meeting room - daily meetings take place in the Inner Light Lodge, a light-filled meeting room, hexagonal in shape and with a 32-foot pyramid-shaped ceiling. 3 sides of the room are glass and overlook the stunning landscape. Chairs, backjacks, pillows and blankets are available for comfortable seating. Smaller break-out rooms with comfy sofas allow for quiet time during break-times. Other facilities - a sacred space for solitude and silent meditation/contemplation is available in the Stillpoint Sanctuary, a small hexagonal chapel surrounded by glass. 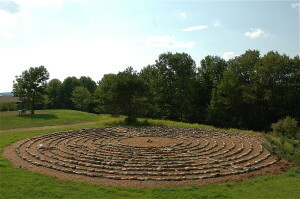 An outdoor Labyrinth is also available for silent walking/contemplation. 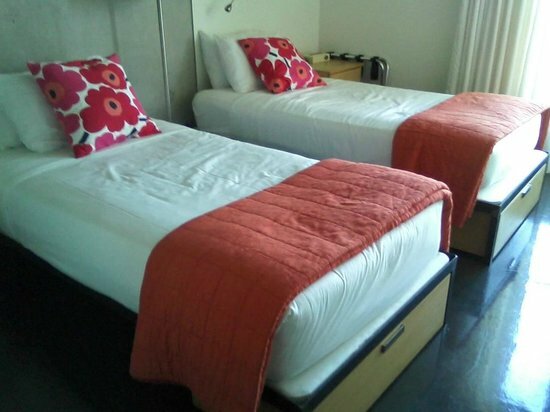 Accommodations - most rooms are single, with a few double rooms (twin beds). Rooms are simple but elegant, modern and comfortable, with large windows overlooking the beautiful grounds. All bedding and towels are provided. Bathrooms are shared and there are several of these (men & women separate) conveniently located in the common hallways. Meals - 3 full meals are provided daily. All meals are vegetarian, with organic ingredients whenever possible. Vegan and gluten-free options are available. Coffee, tea and light snacks (fruit, rice cakes, nuts/nut butters) are also available throughout the day. How to get there - Light on the Hill is easily accessible from Syracuse, Ithaca and New York City. Driving instructions and a map are shown here. Cancellation policy - Prior to July 1st, full refund minus $75 administration charge. After July 1st and up to August 1st, 50% refund. After August 1st, no refunds are possible. Please note - places are limited, we highly recommend you reserve your place in advance. Contact - if you have any questions about this retreat before making your reservation, please email us here. 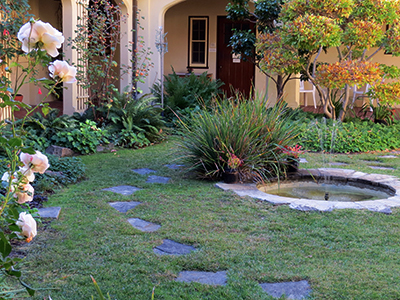 This deep dive retreat is an invitation to fall into the unbroken presence that holds the totality of the human experience. Join us, as we explore what it means to embrace the grit and the grace of being human, as we examine assumptions about spiritual awakening, and as we enter the field of radiant openness that is at the core of all experience. You will be invited to tenderly bring your brokenness, your wildness, and your vulnerability right here into the present moment, to simply be with whatever arises, and to hold it in the deepest acceptance. You will also be invited to courageously bring to light the often hidden tendency for spiritual by-passing, so that the full flowering of your consciousness can be rooted in the very belly of your humanity. “Listen to the visitors who knock on your heart … knocking from the inside. Shame, pain, loneliness, grief and more … all these your allies not your foes. They yearn to come in, to be acknowledged, accepted, loved. For what is broken is the doorway to gold, what is shattered is the entrance to inconceivable love, what brings you to your knees is not a punishment but God’s invitation. Friend, can you embrace the grit and grace of being human? Can you reject nothing, welcome everything, surrender into the deepest falling of the open heart? This is a fully residential retreat - accommodation and meals included (see details below). Held at Synergia Ranch - a unique retreat center deeply rooted in creative arts and eco-technology, with its organic orchard of over 400 trees. It is set on 111 acres of high desert prairie, located 30 minutes from the center of historic Santa Fe and 45 minutes drive from Albuquerque. Synergia Ranch comprises a compound of several buildings, all just a short walking distance from each other. 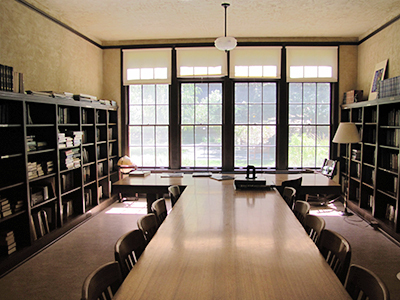 Daily meetings will take place in a spacious studio. Chairs and cushions are available for comfortable seating. The accommodations are in separate buildings very close by, and the dining room is also close by. There is also seating outside the dining room, to enjoy the sun. And a yurt and/or dome, if you wish to take time out or do some yoga there. Accommodations - most rooms are single (queen bed) with shared bathrooms. Rooms are Santa Fe style, built with adobe walls with colorful furnishings and artwork. All bedding and towels are provided. Bathrooms are shared (men & women separate) conveniently located (just a short walk across the grounds). There are also a very limited number of double rooms (twin beds) with shared bathrooms, and single rooms (queen bed, can be a double if shared by a couple) with private bathrooms - please contact us if you wish to find out more about costs and availability. Meals - 3 full meals are provided daily. All meals are vegetarian with as much organic produce as possible. All food is locally sourced, and some of it comes from Synergia’s own farm. Vegan and gluten-free options are available. Coffee, tea and water are available throughout the day. How to get there - Synergia Ranch is easily accessible from Santa Fe and Albuquerque. Driving instructions are shown here. If you are flying in from outside the US, Albuquerque is the closest international airport. If you need any assistance with traveling to the venue or finding somewhere to stay either before or after the retreat, please contact us as we may be able to arrange pick-up (or at least give you advice). Full cost (Tuition + Accommodation + Meals) for Single Room (with shared bathroom) is shown in the Ticket prices below. Cancellation policy - Prior to July 12th, full refund minus $75 administration charge. After July 12th and up to August 12th, 50% refund. After August 12th, no refunds are possible. This Daylong Meeting is an opportunity to join Amoda Maa in an intimate conversation that includes the totality of the human experience within the unbounded space of unconditioned awareness. She asks you to investigate with radical honesty what prevents you from knowing your true nature as openness, and then invites you to live from this openness in the midst of the challenges and turbulence of everyday interactions. The conversation is always spontaneous, allowing jewels of wisdom to arise naturally in support of the journey of awakening and the deepening into living an awakened life. Amoda will be joined by her husband and beloved, Kavi, who will offer improvised music of the heart. His awakening has flowered gracefully through his relationship with Amoda over the past 15 years. There will be a short lunch break - please bring your own lunch. Cost - $95 full rate / $75 reduced rate. Please note - we cannot make refunds if you purchase a ticket and do not attend. If you make a cancellation up to 3 days prior to the event, we can make a refund minus a $15 admin fee. The meeting includes time for Silent Sitting, Discourse, Q & As. Please arrive a few minutes earlier, for a prompt 7pm start. A donation of $15-25 is suggested. No need for advance registration -please pay at the door. If you have any questions about this event, please contact the Open Circle Center using the online form here. This Daylong Meeting is an opportunity to join Amoda Maa in an intimate conversation that includes the totality of the human experience within the unbounded space of unconditioned awareness. The conversation is always spontaneous, allowing jewels of wisdom to arise naturally in support of the journey of awakening and the deepening into living an awakened life. A non-residential weekend (including Friday evening). You can attend one or all days. At this Weekend Intensive, Amoda offers an intimate conversation that includes the totality of the human experience within the unbounded space of unconditioned awareness. She asks you to investigate with radical honesty what prevents you from knowing your true nature as openness, and then invites you to live from this openness in the midst of the challenges and turbulence of everyday interactions. The conversation is always spontaneous, allowing jewels of wisdom to arise naturally in support of the journey of awakening and the deepening into living an awakened life. You are welcome to attend any or all of the days - although we highly recommend that you attend the whole weekend, so that we can dive deeper together. If you choose to book for just one day and decide to attend for an additional day, you can make a last minute reservation at the door (cash or check only) if there are places still available. This is a non-residential event - please make your own arrangements for accommodation if you are coming from outside Seattle. On the Saturday & Sunday, there will be a short lunch break - please bring your own lunch. Teas & refreshments are available during the breaks. Location - held at a private residence in Bellevue (near Seattle), Washington. Full address will be sent after you book your place. Cost - we offer a full rate as well as a discounted rate. Please note - seats are limited, we recommend you reserve your place in advance. Cancellations - Due to limited seating, we have a cancellation policy. If a cancellation is made up to 7 days prior the event (before March 15), a refund will be made minus a $50 administration fee. There are no refunds possible if a cancellation is made on or after March 15 (except in exceptional circumstances). Join Amoda in an intimate conversation that includes the totality of the human experience within the unbounded space of unconditioned awareness. She invites you to inquire with radical honesty if you're willing to surrender all psychological weapons of war - the reactivity and righteousness of the ego - so that you can live as the open hand of love. The Meeting includes time for Silent Sitting, Discourse, and Inquiry (Q&A) Sessions. There will be a short lunch break - please bring your own lunch. Teas are available during the breaks. Experience a cutting-edge perspective on spiritual inquiry. Amoda Maa offers profound pointers to truth that go beyond spiritual tradition or ideology. This immersion into Amoda’s teachings invites you to rest in the silent core of your being. The retreat is a preparation for the winter season, a pruning away of the non-essential to discover what is real and shining as the essence of everything. When you come home to silence, you have the opportunity to experience true abundance and gratitude. Presenting a fresh, feminine expression of awakened consciousness, this program includes talks by Amoda, time for contemplation, question and answer sessions, and silent and guided meditation. Everyone is welcome, including newcomers to Amoda’s teachings and those more familiar with her work. We recommend that you read Amoda's book "Embodied Enlightenment" and/or watch her videos before attending the retreat. Please note - the retreat will be conducted in social silence (speaking only when necessary) outside of program sessions. This is a fully residential event, held at the Kripalu Center for Yoga & Health - there are a variety of accommodations available and all meals are provided (see details below). Breakfast is served daily, 7am - 8.30am / Lunch, 11.30am - 1.30pm / Dinner, 5.30pm - 7pm (except for first and final day, as shown above). In between the daily sessions, you are invited to sit, walk, jog, or meditate in the many beautiful areas of Kripalu Center which is surrounded by than 100 acres of beautiful land, with breathtaking views of hills and a lake, as well as a Labyrinth and Meditation Garden for contemplation and silence. Daily Yoga Classes are available, these are provided by the Kripalu teachers and are optional. There is also a Fitness Room, Sauna, Cafe, and Gift & Book Store to explore. In addition, there are a variety of Bodywork and Facial Rejuvenation Treatments available - these need to be booked in advance and there is an additional cost. The Kripalu Kitchen uses all-natural, organic, locally-sourced foods, prepared with love and care - mostly vegetables, fruits, wholegrains, as well as a variety of poultry and fish. All meals are served buffet-style, and there is also a Buddha Bar section with purely vegetarian Ayurvedic options. 100% gluten-free ingredients are used. You are welcome to bring supplemental foods if required, and there is a kitchenette available for your use. Organic teas, coffee and snacks are provided in the break-times. A range of Shared and Private Rooms are available, all decorated in a simple yet elegant style. Accommodation (including meals) costs range from $348 for a dorm-style room with shared bathroom to $460 for a double room with shared bathroom to approximately $700 for a single/double occupancy with private bathroom. Registration and tickets are available only through Kripalu Center. The closest airport is Albany. There is a shuttle service to Kripalu Center. Alternatively, you can fly to Boston or New York City. There are buses or trains from there to close by, and then a taxi or shuttle to Kripalu Center. There will be 2 gatherings offered in Santa Fe - an evening and a daylong. You are welcome to attend just one or both. (registration and tickets are below). Each day includes time for Silent Sitting, Discourse, and Inquiry (Q&A) Sessions. Both newcomers and those familiar with Amoda's message are welcome - although it is recommended that you watch her videos or read her book 'Embodied Enlightenment' prior to attending this event. Seating (chairs, backpacks, cushions) will be provided on both days. For the daylong, there will be a short lunch break (there are cafes and restaurants close by, or you can bring your own lunch). Cancellation policy - refunds are not possible for the evening meeting on November 9. But in the case of a necessary cancellation for the daylong meeting on November 10, a refund minus an admin charge of $15 is possible before November 7 (there are no refunds after this date). The nondual rubber hits the road in our intimate relationships where we must face all that remains hidden in the shadowy recesses of our hearts. This includes our unexamined beliefs about love, the fear of aloneness, and the powerful emotions that arise when our buttons are pushed. Wherever we are on our spiritual path, relationships can offer a crucible to see where we are identified and defended. They can also help us transform co-dependency to a deeper communion in which we relate to one another from a sense of genuine inner freedom and fullness. In this presentation, Amoda will speak about the true purpose of relationship, as well as speaking from her own direct experience of being in a long-term relationship. She will explore central questions, such as: What is it like to relate from an inner fullness rather than lack? How does the awakening process impact the experience of intimacy? How does one deal with emotional reactions when they arise? What if one’s partner has no interest in the process of awakening? Is there such a thing as an “enlightened relationship”? She will also take questions from the audience. The Science and Nonduality Conference is a gathering inspired by timeless wisdom, informed by cutting-edge science, and grounded in personal experience. SAND honors and nurtures the exploration and experience of nonduality as a pathway to greater wisdom and wellbeing in the context of the unique challenges of the 21st century. This is a FREE event - please reserve your place in advance. Many of us yearn to evolve out of our limited consciousness. Some have had momentary experiences of an awakened state, yet true peace and spiritual fulfillment are still elusive. In this daylong meeting, Amoda Maa unravels some of the myths of enlightenment as a transcendent state, inviting you to discover authentic freedom by being both fully awake and fully human. There will be time for inquiry and silent sitting. In this Weekend Intensive, Amoda offers an intimate conversation that includes the totality of the human experience within the unbounded space of unconditioned awareness. She invites you to inquire with radical honesty if you're willing to surrender all psychological weapons of war - the reactivity and rightousness of the ego - so that you can live as the open hand of love. Amoda will be joined by her husband and beloved, Kavi, who will offer improvised music of the heart as well as engaging in the conversation with his wisdom and love. Kavi is a "holistic inquiry" coach, as well as a talented musician. His awakening has flowered gracefully through his relationship with Amoda over the past 15 years. You are welcome to attend any or all of the days. Although we highly recommend that you attend the whole weekend, so that we can dive deeper together. If you choose to book for just one day and decide to attend for an additional day, you can make a last minute reservation at the door (cash or check only) if there are places still available. Cost - we offer a full rate as well as a discounted rate. See below for tickets. Location - held at a private residence in Bellevue (near Seattle), Washington. Full address is to be confirmed and will be sent after you book your place. Please note - this is a non-residential event, please make your own arrangements for accommodation if you are coming from outside Seattle. Cancellations - If a cancellation is made 3 days or less prior to September 28, a refund all be made minus a $50 administration fee. There are no refunds if a cancellation is made on or after September 28, or if you do not attend the event. Please note - we are SOLD OUT for Saturday and Sunday. There are a few more places available for the Friday evening. Please reserve your place in advance. Although it is also possible to simply show up and pay at the door - if you choose to do so, please make sure you arrive about 5-10 minutes before the start so we can register you. Held in a container of unconditional acceptance, you will be supported in the process of purifying the heart. Through tender openness and unwavering honesty, you will be invited to bring to light everything that stands in the way of your true radiant nature as love. And together, we will enter the slipstream of unspeakable grace inside the human experience. The Daily Schedule will include Talks, Inquiry (Q&A) Sessions, Silent Sitting, Guided and Active Meditations. There will also be time for contemplation, rest, walking, and enjoying heart-centered celebration with each other. This retreat will be supported by Kavi (Amoda's husband and beloved), who will provide music of the heart, and his own unique brand of wisdom and unbounded love. Immersions are for those who are ready for real transformation, and the results are often life-changing. We recommend that you already are familiar with Amoda’s teachings, by having attended at least one of her live events, participating in at least one private session, or having read her book 'Embodied Enlightenment'. The meeting room - daily meetings take place in the Inner Light Lodge, a light-filled meeting room, hexagonal in shape and with a 32-foot pyramid-shaped ceiling. 3 sides of the room are glass and overlook the stunning landscape. Chairs, backjacks, pillows and blankets are available for comfortable seating. Smaller break-out rooms with comfy sofas allow for quiet time and intimate conversation during break-times. 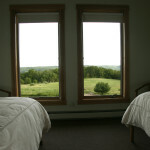 Accommodations - most rooms are single, with a few double rooms (twin beds). Rooms are simple but elegant, modern and comfortable, with large windows overlooking the beautiful grounds. All bedding and towels are provided. There are ample bathrooms (men & women separate) conveniently located in the common hallways. Meals - 3 full meals are provided daily. All meals are gourmet vegetarian, with organic ingredients whenever possible. Vegan and gluten-free options are available. Coffee, tea and light snacks (fruit, rice cakes, nuts/nut butters) are also available throughout the day. How to get there - Light on the Hill is easily accessible from Syracuse, Ithaca and New York City. Driving instructions and a map are shown here. If you are flying in from outside the US and need assistance with travel to the venue, please contact us (see below) and we'll try to assist you. If you need to stay an extra night before or after the retreat, you may be able to stay at the center for a small additional cost or we may be able to help you make other arrangement. Full cost (Tuition + Accommodation + Meals) for Single or Double Room at the Full and Reduced Rate options in shown in the Ticket prices below. We can also offer a Payment Plan if you need this - please contact us here before reserving your place. As awakening descends from the sanctuary of enlightened mind to the fullness of the heart, a deeper surrender is called for. It’s in the places where it hurts - such as relationship, pain and loss - that awakening demands a deeper opening and willingness to be vulnerable. Whether we’re talking about our relationship to an intimate partner, a family member, a passing stranger, the world or even to our own feelings - the invitation is to put down our weapons of war and meet everyone and everything as the open hand of love. In this way, relationship becomes a potent doorway to awakening as a lived expression. How do we deal with triggers in relationship? Are you willing to face the fear of aloneness? Are you willing to expose the myth of the special relationship? How do we stop making an enemy out of those who don’t agree with us or give us the love we want? What is the true purpose of relationship? Amoda will be joined by her husband and beloved, Kavi, who will offer improvised music of the heart as well as his wisdom and love. Together, they will also offer insights from their own relationship.